You can add the term diagnostics to your search. 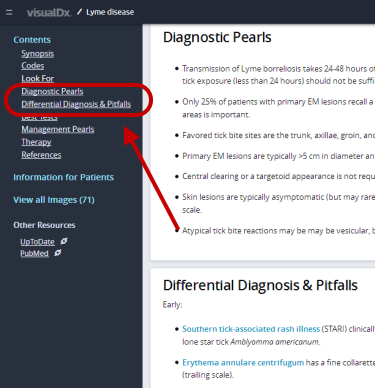 Or, after searching for a disease or condition, you can click on the Clinical Overview link and select Diagnosis. 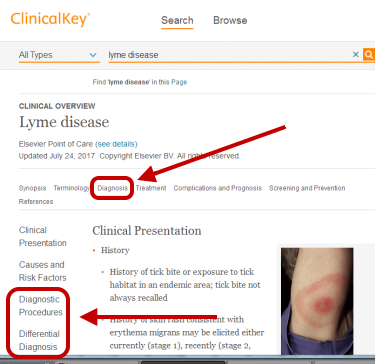 ClinicalKey is a clinical search engine that supports clinical decisions by making it easier to find and apply relevant knowledge. Also, there is an app for this. 1. Follow this ClinicalKey link and click on "Register" in the top right hand corner. 3. On your mobile device, download the ClinicalKey app and log in with your ClinicalKey username and password that you created when you registered. Once you are registered, you can access ClinicalKey from anywhere with the username and password you created. You will need to register to download pdfs and to save images. From JoVE: Journal of Visualized Experiments, Clinical Skills videos that include Physical Examination, Emergency Medicine and Critical Care, and Nursing. 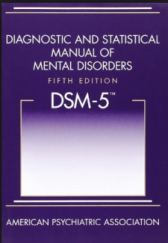 This is the standard reference for clinical practice in the mental health field. 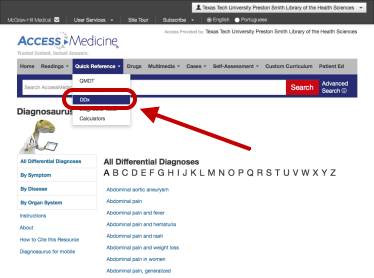 Through Access Medicine, Diagnosaurus is a differential diagnosis tool searchable alphabetically, by symptom, disease, and organ system. It is available as a mobile app through the Access Medicine app. For access from anywhere and via mobile device, create an account by following this AccessMedicine link to their website. 1. Click the down arrow next to the Mercer University box in the right hand upper corner. 2. Then "Login or Create a Free Personal Account"
3. A popup window will appear. Select "Don't have a MyAccess account?" and fill in the requested information and select "Create Account"
4. On your mobile device go to the App/Google Play store and download AccessMedicine. Log in and content should download. Dynamed Plus is a point-of-care information resource that includes drug and disease information. 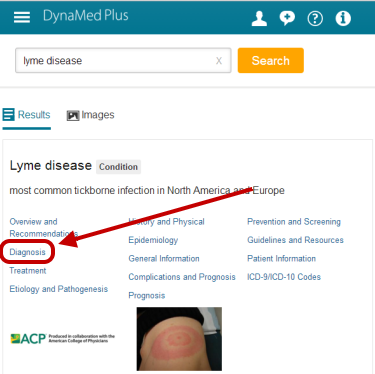 DynaMed Plus contains more topics than Epocrates Essentials or FirstConsult and also provides more detail on clinical interventions and the quality of evidence for that information. DynaMed Plus is provided to you courtesy of the MUSM Skelton Medical Libraries. You can use it to find evidence-based information on specific conditions including diagnostic approaches. Access DynaMed Plus then click on Sign In/Create Account in the top right hand corner and fill out the form for access anytime, anywhere, on any device. You must have a personal account to download the mobile app from the App Store or Google Play. 1. Follow this VisualDX link and click Get the Mobile App" (center of VisualDx homepage). 2. Create your personal username and password as instructed. You will receive an email from Logical Images. 3. Once you have a username and password, you can download the free VisualDx Mobile app on your mobile device from the iTunes Store or from Google Play. 4. Launch the VisualDx app from your device and sign in using the username and password you created. Quickly access clinical information and images about a diagnosis in VisualDx.